Greetings unto the masses from the Office of the Western Seas Chronicler! 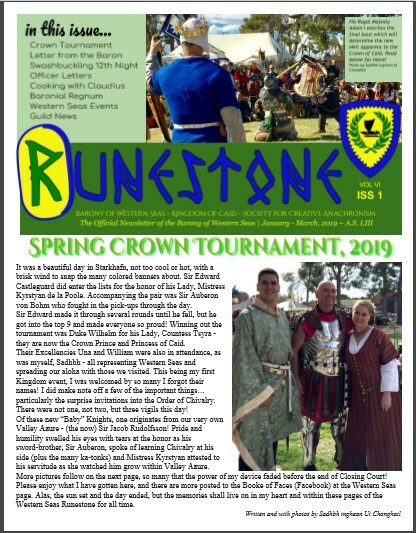 Released upon this day is the latest issue of the Baronial Newsletter, the Runestone! Covering news and events submitted to this office from January through March of 2019 CE. The next issue will be distributed at the end of June. The Runestone is the official newsletter of the Barony of Western Seas – distributed on a quarterly basis via this website. To submit your article, please send it to the Office of the Chronicler of Western Seas. To submit an Event, please use the online form. You may partake of this, and previous issues of the Runestone via our Library. 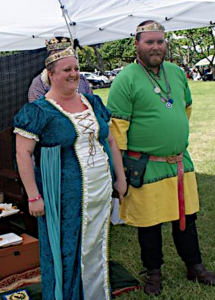 Baron Andrew of Fairburn and His Lady, Baroness Kathryn of Caledonia at their coronation, October, 2018. This is the recognized web site for the Barony of Western Seas of the Society for Creative Anachronism, Inc. and is maintained by The Barony of Western Seas Webwright. This site may contain electronic versions of the group's governing documents. Any discrepancies between the electronic version of any information on this site and the printed version that is available from the originating office will be decided in favor of the printed version. For information on using photographs, articles, or artwork from this web site, please contact the Webwright at webwright@westernseas.org. You will be assisted in contacting the original creator of the piece. Please respect the legal rights of our contributors. Copyright © 2019 Barony of Western Seas. The original contributors may retain the copyright of certain portions of this site.